Click here to read an excerpt of the book. Dave Harrity was one of the first people I met when my family moved to Louisville, KY in the late 90s. We were both going into our freshman year of high school. I was still struggling to adjust to life in America after living overseas for most of the past 10 years, and Dave was a boisterous New Jersey transplant, already established and well-connected. If I had to pick one person who I thought would become a respectable poet in my class, Dave wouldn’t have been my first choice. I knew him OK. We attended the same youth group on Sundays and hung out every once in a while. He was the guy most likely to swallow a lead fishing sinker, accidentally tip a canoe in ice cold water, or randomly inject “randy” into conversation, even in Geometry where a flustered “Madame Fro-bush” often failed to control the class. But now that I think of it, there was the one time he conned some of us into going to a poetry reading we thought was going to be a killer ska show, and it probably would have been if the lead singers were singing instead of reading their poetry. Maybe it was an honest mistake. Maybe not. I didn’t realize Dave was a poet until after I had moved back to the area and looked him up on Facebook. He had a chapbook out, and had graduated from Spalding University’s Brief Residency MFA program, a program I’d later complete myself. I soon discovered that not only did he write poetry, but he was writing pretty good poetry. Fast forward to today. Dave has had success with his book Making Manifest, teaches at Campbellsville University, and has played an important role in the formation of The Association for Theopoetics Research and Exploration and serves as creative editor for its associated journal, Theopoetics: A Journal of Theological Imagination, Literature, Embodiment, and Aesthetics. 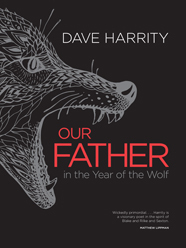 His two latest books are These Intricacies and Our Father in the Year of the Wolf. Our Father in the Year of the Wolf is the type of book that helps bolster a poet’s reputation. Although the poems will often challenge the reader, the subtle but pervasive music is a strong enough engine to keep most readers engaged. Harrity's lines are often long, but pleasantly long the way Whitman’s lines are long. Lines that span the entire width of the page often fall naturally into pleasant "breaths." The music of the poems serves as an ordering mechanism. Even when the poems are thematically dense, the music encourages the reader to trust the poet and to return to the poems again and find each time a richer experience. But even when it is difficult to process the poems intellectually, the book makes profound emotional sense. This is a great testament to Harrity's skill as a poet. Dave took a little time out of his busy schedule to answer some questions by email. First of all, congrats for releasing not one but two books of poetry in the past year or so. If you were to tell me in high school that you were going to be a poet, I don’t know that I would have believed you. So how did you come to be a poet? First, thank you for asking me to do this—I’m honored and full of gratitude! As for your question: Hah! I was a poet in high school, but I was quiet about it. No one knew except one of our classmates. I wrote her poems to try to get her to date me, and it worked for a while. She liked poems. The relationship didn’t last, but I kept writing. And just never stopped really. I became a poet by doing, not by reading. That’s important for me. I’ve since developed a habit of study, but it came after the fixation I had with creating. We are both graduates of Spalding University’s MFA program. I can understand some of the criticism MFAs receive, but my experience at Spalding was overwhelmingly positive. Briefly, what influence has your MFA had on your literary career? I had a good experience at Spalding as well, and I think that had to do with the literary community it provided for me. It was a place where I didn’t have to explain myself—I could have this strange, shared artistic fixation; I could ask questions to friends and read and write alongside them. The MFA taught me how to demand meaningful interactions with other artists. I worked so hard in that program—took full advantage of my profs and peers. The MFA helped me understand how important it is to have literary and creative relationships—I still have some very close relationships from Spalding. Of your two most recent books, These Intricacies seems more contemplative and accessible, while Our Father is denser, darker, and more experimental. Did you write these books with a specific purpose in mind or was their creation more organic in their development? They both sort of materialized as their own projects. Most of the poems in both books were written post-MFA. I was writing all the poems at the same time though, since about 2007. The poems in TI are certainly older, and an editor approached me about making a book. At the time, I had a manuscript. He looked at it and asked me to send as many other poems as I could. We worked from there to make the book. Our Father was always conceived as a book-length project. I kept writing the strange poems and just piled them all in a folder. After about four years of this, I pulled the folder out and began stitching them together. When reading Our Father for the first time, I was struck by its remarkable depth, and I feel like I have a richer experience each time I revisit the book. It’s exquisitely woven, whether it’s the thematic movement from poem to poem, illustrations of the moon passing through different phases, or the interaction of poem titles. What was your revision process like for this book? Did you focus more on the individual poems or the work as a whole? Thanks for saying that—man. That’s a really wonderful compliment and I’m glad it worked that way for you. I hope the same for all who read it! Originally, the manuscript was over a hundred pages. Which was crazy. I cut it down to sixty pages. Lots and lots and lots of cutting—ruthless. I tried to trust what the poems were trying to be, which was unfamiliar at first. But as the process moved forward, I began working in this strange, long tercet, and the voice in the poems began to ring clearer. The form really helped to order the book, which had never happened to me before. It was an uneasy delight the whole way. You mention hagiography in the author’s notes. Could you briefly explain what that is and maybe give an example of the role it plays in this collection? Yeah… that idea—the narratives of the lives of saints—has always captivated me. The lives of early martyrs in the Christian tradition, especially. The stories are so fanciful and bizarre—they’ve always seemed to be the most interesting secrets of the Christian Church, though similar styles or narrative abound in other faith traditions. In Our Father, there is this cursed family—focused mainly on the father and son. I read a story about St. Natalis of Ireland who cursed the Meath Clan when they wouldn’t repent from their evil. He cursed them to be werewolves. I just found the whole story captivating and thought I could use it, quite loosely, as the basis of the book since monsters/beasts—wolves, in particular—were dominating the metaphorical structure of the book. In Making Manifest you argue for writing as spiritual practice. Our Father is full of biblical allusions and influence from other religious sources, but the book seems to embrace mystery and acknowledge nuance rather than evangelize or provide Sunday school answers. How is Our Father a reflection of your theology? Oh dear… I’m going to have to speak generally, and you’ll have to forgive me for it. I feel so estranged in/from discussions of faith and art. In my travels and teaching I’ve learned most believing people don’t want art, especially if it seems contrary to whatever they’re bred to believe, or—at the very least—art isn’t a priority of the faith experience for the majority of religious folks. Sure, there are people who are serious about their faith and their art—I know many such people deeply, and I’m not talking about them here—but art seems to be largely dumbfounding to “the faithful” unless it does evangelize or affirm what’s learned in Sunday School. Whatever that nonsensical conglomeration of creative things is, I can’t usually name it as art or artfully made. On top of that, making art is an act of existence, of living into one’s embodiedness—one’s humanness—and there are more than a few people in the pews that think that existing as one is is sinful. I told a student recently—he writes poems—that if he wants to be an artist and is a person of faith that he should bury that faith so deep into his poems that no one but someone just like him will know it’s there. If you ask me, all things worthwhile sing to one another from the depth. I also told him not to trust people who claim faithfulness but have no creative life. Generally speaking: it’s usually dangerous or unfair to discern a person’s theology through a person’s art, I think. And the acts of mixing theology and art—with some fantastic exceptions—are often irrelevant disasters that suffer from didacticism and are blind to how extraneous, inappropriate, or just plain silly they are. My work has been there. That said, there are so many brilliant artists of faith that get little attention outside of literary circles—God, so many brilliant ones. And that’s a sin—that their voices aren’t known. As for Our Father and me, I don’t know if it reflects a theology, much less my own. You experiment with longer lines in many of these poems, which can be dangerous when paired with the kind of weighty subject material and dense language you use in this book, but your lines have a natural “breath” to them that allows the reader to process them in small chunks. You also experiment with space and breaks within the line in a way that pays respect to form and tradition, but is fresh and contemporary. Could you talk about the role form played in developing these poems? As I said before, the long tercet became the book’s fingerprint. With lines like that, however, I had to really work to understand the caesura, which is something that alluded me until this book. Also, in this book, I worked to master metrical structures, which are important to me as a poet, and have always been important to my work. I think I gained some ground, but what I love about poems is that I will spend the rest of my life working on sounds. How do you approach titling poems? You do it so well. “If the Silver Could be Given Back & Prophecies Erased” is a brilliant title, and the titles as a whole in this book carry a lot of weight and significance. That’s a really tough question—in this book I tried to embody the poem with some kind of Scriptural, historical, or philosophical referent. Sometimes it worked, sometimes it didn’t. As a parent to two kids under the age of 4, I struggle to get a lot of writing done. You have two kids, a wife, a job, and a literary career. How do you find time to write and be a part of the literary community? You don’t find it, you make it. If my writing doesn’t get done, I’m the only thing that forced it not to happen. Make time. No one else is going to do it for you. But if you’re lucky and smart you will surround yourself with people who remind you of what you should do and help you do it. And don’t forget to play with your kids every day. Lastly, what projects do you have on the horizon that we should be watching for? Right now all I’m doing is working on a poem every day and playing blues guitar. I don’t think anyone will be hearing much creatively from me any time soon. But if you see me, say hello!